Each piece of our artwork is inspired by story, for the story is what connects us all.The creations you find here are from us, a husband and wife Artisan team from the Appalachia. 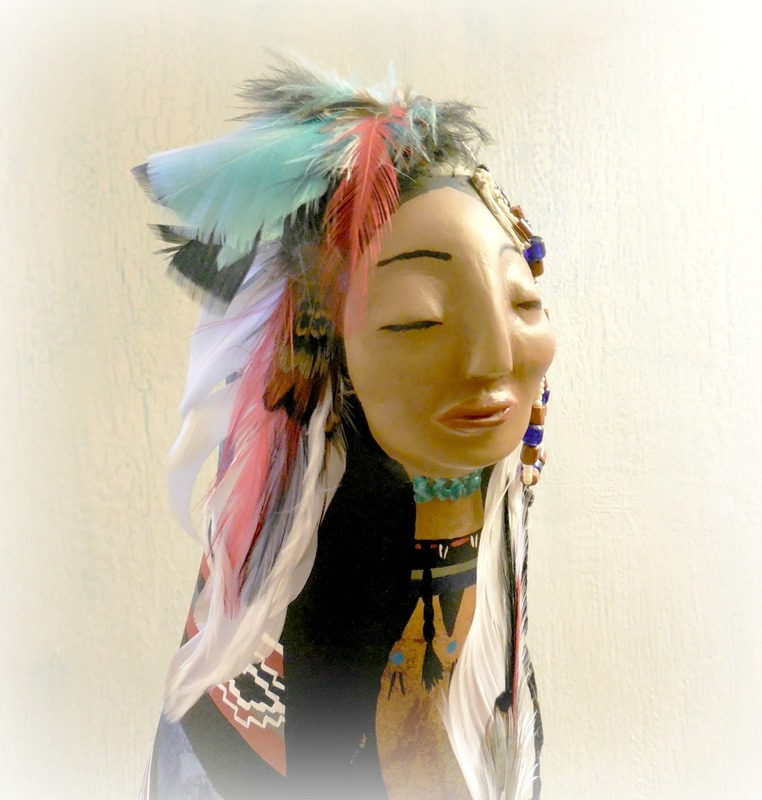 We offer Contemporary Folk Art Paintings,Native Flute Music, Eastern Woodland Style Flutes, Folk Art and Spirit Dolls, Gourd Art, Gourd Jewelry, Drums and Rattles, and Animal Totem Stones. Here on our blog you can find the symbolic meanings behind our artwork, and animal totem meanings. I am a Caretaker of the Earth. 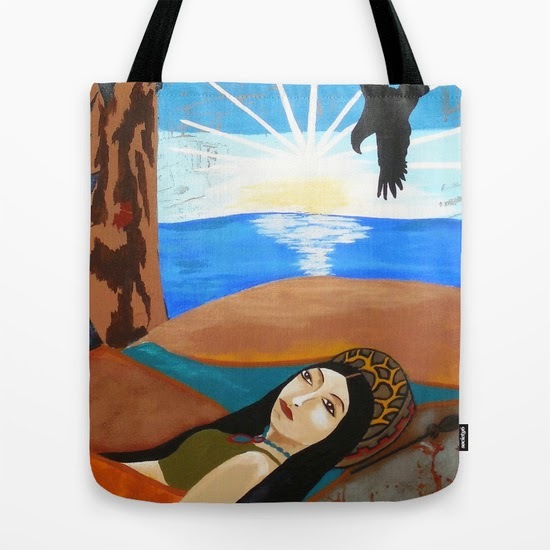 "Ancient Dreams" was created to be symbolic for those who walked before us, our ancestors, our Grandmothers. She serves as a reminder of what our grandmothers taught us in honoring our traditions. She wants us to remember that as this world changes so rapidly and technology grows so fast, to still take those moments that we need to stay grounded and connected to our roots and Mother Earth. In our dreams we have a vehicle for connecting to our most authentic selves, our strong intuitive sense, and to be able to hear the messages that are sent to us. We are divinely guided and always surrounded by our Guardians, and "Ancient Dreams" is a daily reminder of that. We know that when we are overwhelmed, simply taking a few moments outdoors can bring a balanced sense of peace to our soul. We often neglect taking the time for ourselves, placing so much importance on the seemingly never ending list of things to do, but sadly taking care of ourselves is not often on that list. This grandmother wants to impress on us that "quality" time is needed for healing, not just time in the nothingness in front of the television, listening to the negative noise. She wants us to take the utmost care of our spirit in order to stay connected - time outdoors, with animals, in prayer, and with our families. When we have done so, those moments in our restorative sleep bring the dreams filled with the most healing and loving qualities. 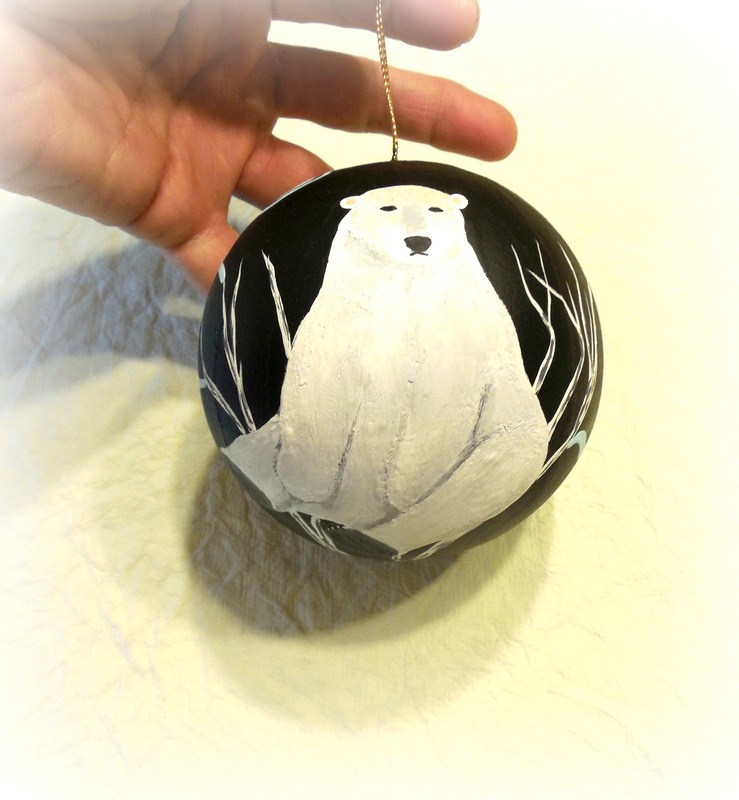 I've painted Bear Totems for years, so many Black and Brown bears in my creations, but over the past few months I have been attracted to the beautiful Polar Bear. 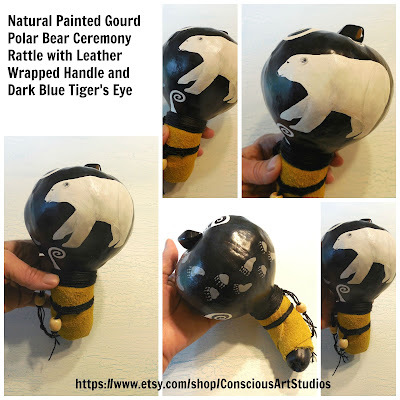 My first was a custom requested Polar Bear Gourd Ceremony Rattle which motivated me to start learning more about them. Since then I have worked with and learned more and more about their energy. The Polar Bear is a very special animal teacher. 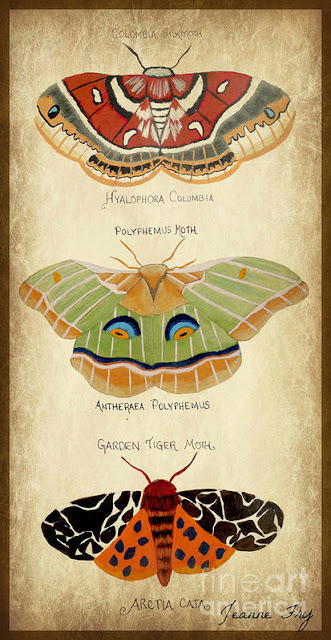 They are known for pure spirit, exceptional strength, and make choices based on their inner knowing and never their fears. They are resourceful, even when it seems as if there are no resources, which when coupled with their perseverance and adaptability makes them a motivating survivor. They can go the distance, able to attain their vision. They teach us the importance of making clear choices that are based on our highest good - the choices that can lead us toward following our calling -not the choices that can keep us down. They represent cycles, and moving through them, and allowing them to flow from beginning to end....andto have the wisdom to know when a cycle is absolutely complete and needs to be let go. The Polar Bear can teach us much about Energy, how to conserve it, and how to spend it. They remind us that when we live our life with a pure and honest heart, our spirit has open communication with Source. Their white fur (purity in spirit) is their camouflage, allowing them to hunt in a way that they can stand back, watch, and listen. This combined with their focused patience makes them highly effective hunters, lending to decisiveness and strategic planning. They fully utilize their senses and capabilities, able to smell a seal (their primary food source) up to 1 mile away. They are "sure-footed" on ice and slippery terrain, having dermal bumps on the pads of their feet for traction - symbolic of ability to navigate difficult circumstances with balance and a confident spirit. Their claws are deeply "scooped" for digging in ice, which symbolizes an aptitude in searching for answers and meaning in life. Their skill in the water allows them to swim for days at a time, up to 6 mph. In fact, they spend more time in the water, then they do on land. Their scientific name is Ursus Maritimus - which means Maritime Bear. This strong bond with the water is symbolic of a balance of emotions. While the Polar Bear is a strong effective hunter, they are also extremely nurturing and protective of their young. They are not territorial as one might think, and often choose to escape instead of fighting. Often the Polar Bear will lead a mostly solitary life, though I don't consider this lonely, but symbolically in a place where one is happy and content with themselves and who they are. She walks with Lizard Medicine, the wisdom she carries from her life-long totem the lizard. The lizard has taught her to trust in her dreams and in her intuition, for she alone has the best answers for the life she lives. The lizard has also taught her to watch over and protect her highest good. She now understands and can recognize when something no longer serves her and with that she has learned how to let those things go with grace and moves on. She knows that she needs to tend to her own needs first, before she can help anyone else. She is the Lizard Keeper. 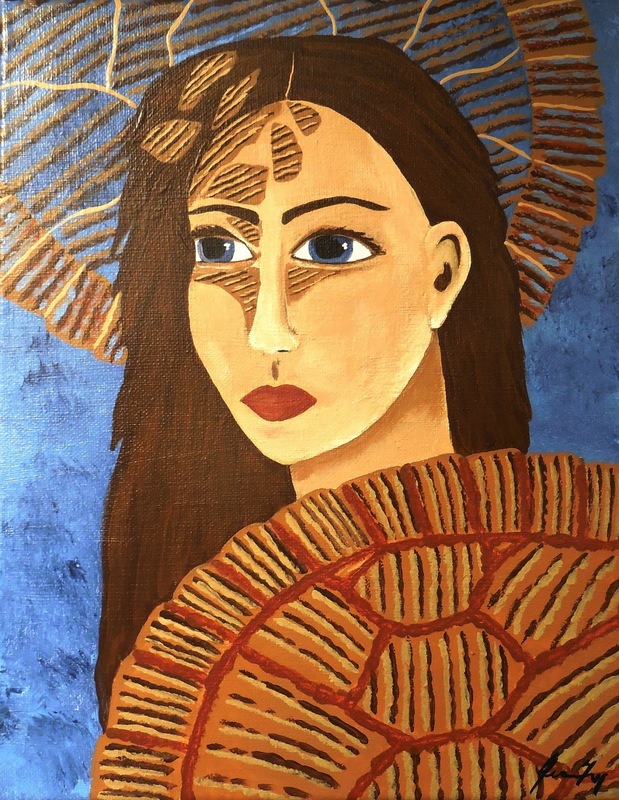 This painting, “The Lizard Keeper”, is a contemporary folk art painting by Jeanne Fry. It was created with acrylics on a 12 inch x 12 inch canvas. 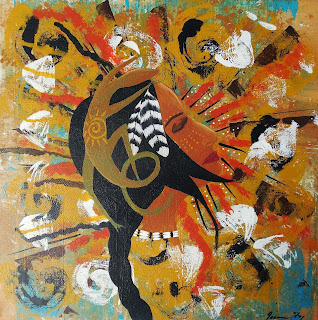 The background is layered with primitive spirals done in yellow ochre, titanium white, and burnt orange with hints of turquoise under the layers. 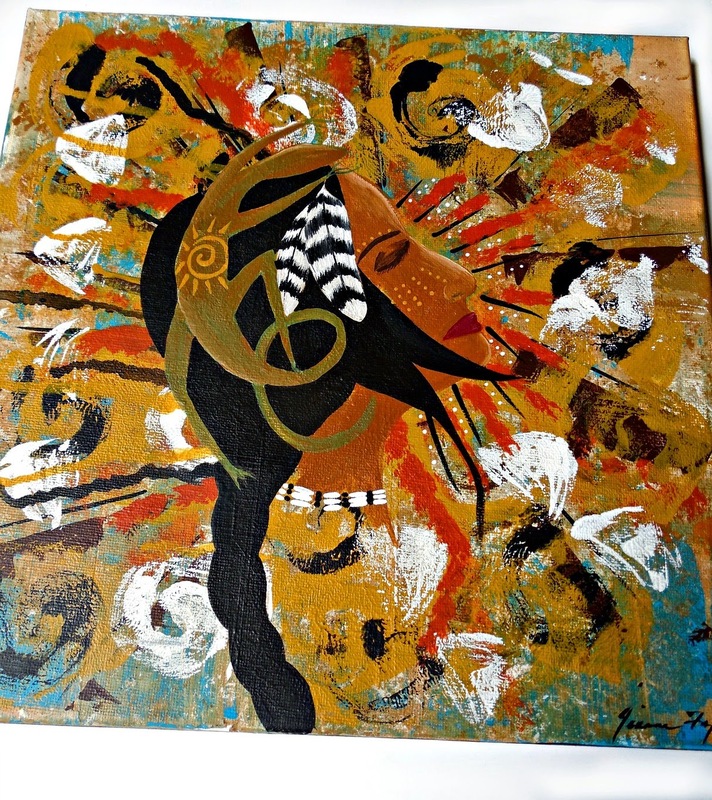 The head and shoulders of the native woman can be seen amidst the spirals, her face raised slightly towards the sun and it’s brilliant rays. She wears two feathers in her hair and a bone choker around her neck. Her lizard totem is painted embraced around the side and top of her head. A spiral sun is painted on the lizard. The painting is signed on the front, signed and titled on the back, and sealed with a satin finish. The sides of the canvas are painted black to give it a clean contemporary feel. Gallery wire is installed on the back for ease in wall hanging. Your home is your Sanctuary, a place of Renewal, Hope, and Healing. It reflects who you are, what you believe, and your aspirations.When our homes are in harmony, they are a center of energy that we draw from. Many tools can be used for Space Clearing such as : Smudging Herbs, Bells, Gongs, Tuning Forks, Singing Bowls, Wind chimes, Drums, Rattles, Clap Sticks, Clapping, Chanting, Singing/Music, Flutes, Salt, and Aromatherapy are some of the most popular. Today I am going to talk about using Gourd Rattles as a tool, and the technique that I use for Space Clearing. There are no "absolutes" when space clearing, as much of the process is focused on intention, but symbolism is beneficial. 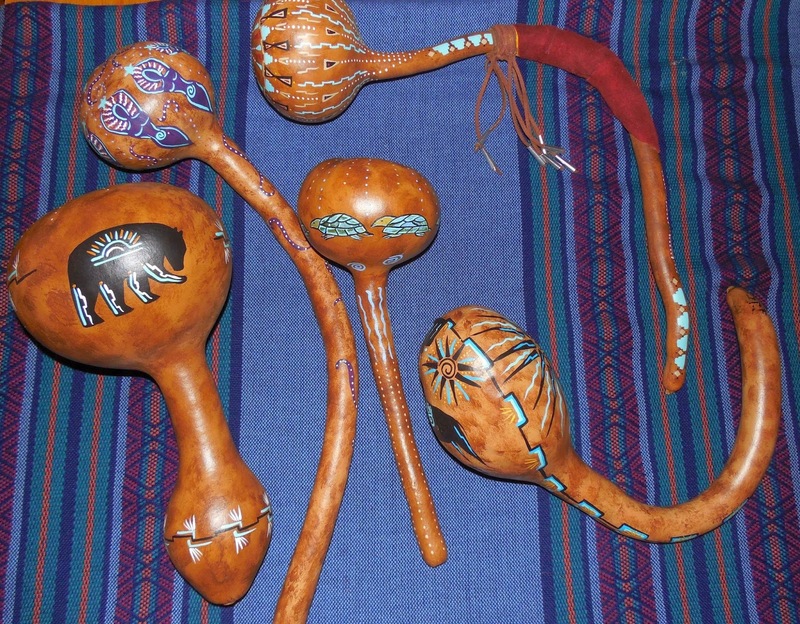 Rattles come in many shapes and sizes and can be created out of many different mediums, although we create our Ceremony Rattles out of Gourd and Wood, with Wrapped Handles. Whatever tool you use for Space Clearing, will bring a different aspect in the cleansing. Gourd Rattles create a gentle energy field and help the use stay Grounded with its connection to the Earth. Setting Intentions: This is when you Offer Prayer - Clearly state your intentions for the Space Clearing (i.e. clearing negativity or blockages, attracting prosperity, etc). Calling in or Setting Positive Energy: Many different tools can be used for this. Particularly beneficial ones would be flutes, wind chimes, small bells, sweetgrass smudge, or aromatherapy. I will often create a Lavender Room Mist, being one of my favorite tools. Room mists can be purchased, but are quite easy to make using a few drops of Lavender Essential Oil diluted in water in a dedicated water mist bottle. You work through each room, just as you did during the cleansing pass, and mist occasionally. When finished, you can set the ceremony with prayer. The following is one of the prayers that I use, or you can create your own. There are many many ways to Space Clear, and you can be creative with your process. Again, it is focused on Intention. We create Gourd Ceremony Rattles that can be used for Space Clearing, Prayer or Meditation. 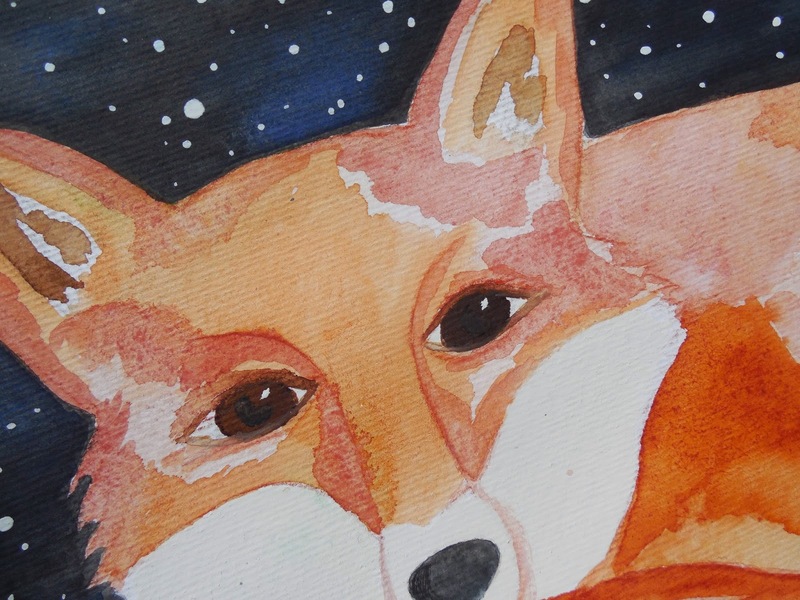 The Fox is often misunderstood and is an amazing totem to work with. I consider them the teachers of "street smarts", useful when you know where you want to be but need to figure out how to "get there". This beautiful world is full of miracles and opportunities, but that does not take away its ability to be challenging and competitive. We also learn when we get out into the world, that not everyone thinks like we do, and that there are people who do not live with every one's higher good in mind. 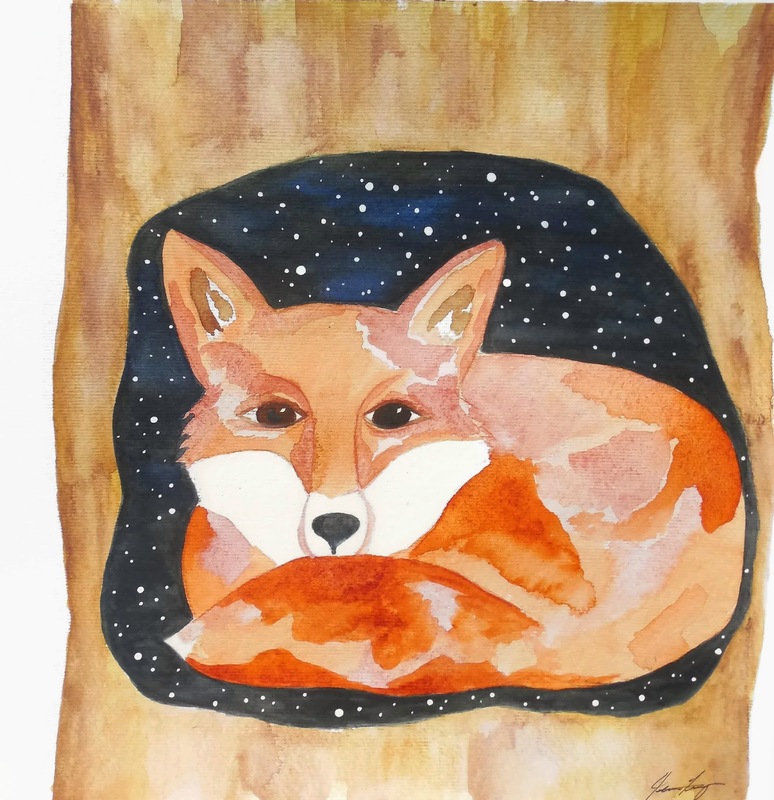 The Fox totem can help us learn to navigate those waters, not by changing the essence of our own spirit, but by using subtle tools. For instance, the Fox is symbolic for camouflage and blending into his environment. Sometimes the act of being still or quiet and blending in allows us to be able to see and hear things that we might not notice otherwise...things that are important to know about our journey. It takes us out of our "me" oriented mode and fosters an opportunity to see the bigger picture or more aspects of a situation. When the Fox runs, his tail extends straight out from his body. This is an aspect of Balance. It allows the fox to run and turn with and ease and flow, while staying on course...no distractions, no breaking of the focus, just determined on the "getting there". They are perceptive and keen, relying heavily on their senses and their intuition. When they combine this with the capability of camouflage, they can be a mighty hunter. Their hunting mode is also one of their unique aspects - being a smaller animal they can use a "charming" technique, that throws their prey off. While they are part of the canine family, their mannerisms are more likened to the feline family and the feminine. The Fox protect themselves with their large fluffy tail, wrapping it around themselves to guard against the elements. This symbolism can be taken further teaching one to be diligent in protecting themselves from the harshness of others by creating a protective field around themselves. All of these things that define the Fox allow him to reach his wants and needs, doing so in a bit more subtle yet defined manner, focused on the goal while being aware, being immensely creative and intuitive, and all the while knowing when they need to shield themselves. This week as I was creating a new Gourd Art Vessel, my mind was drifting. I was painting a geometric design on the front of the Gourd, in soft soothing colors of dusty periwinkle and cream. As I painted the shapes I noticed they began facing different directions. Along the side of the Gourd I had adorned the lacing with a strand of oval wood beads. While the wood beads hung in a straight line, the geometric shapes had a more diverse path. It made me think of our Spiritual Journeys, and how each one is our own. There is no right way or wrong way....when they are focused on the Higher Good for all. It is a journey of twists and turns, learning and growing, compassion and love. And along the way, reminding ourselves to enjoy each and every Moment. The Spiritual Journey Gourd Vessel is listed in our Etsy shop, where you can learn and see more of it. 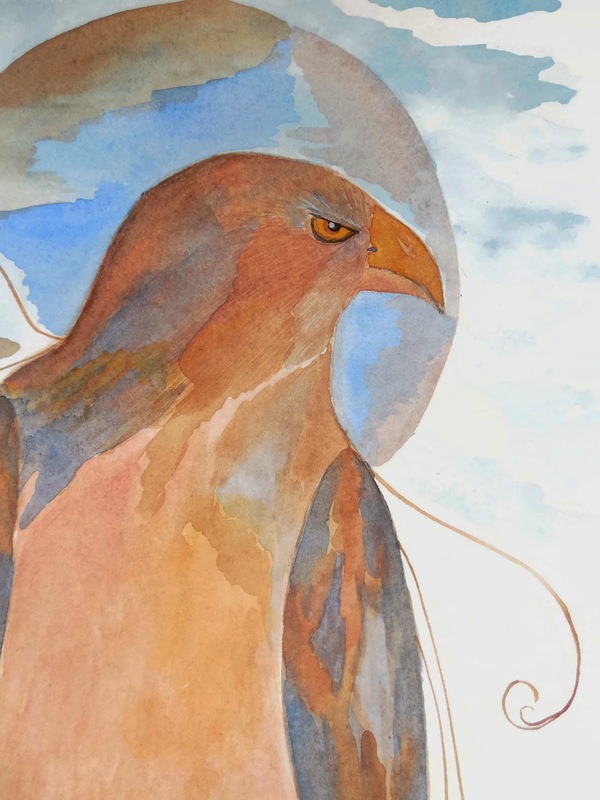 I recently spent some time re-visiting the Red Tailed Hawk and his importance connected with our Soul Purpose. I have studied on him before, spent time in connection and creation with this totem, but this week he has come back to me. 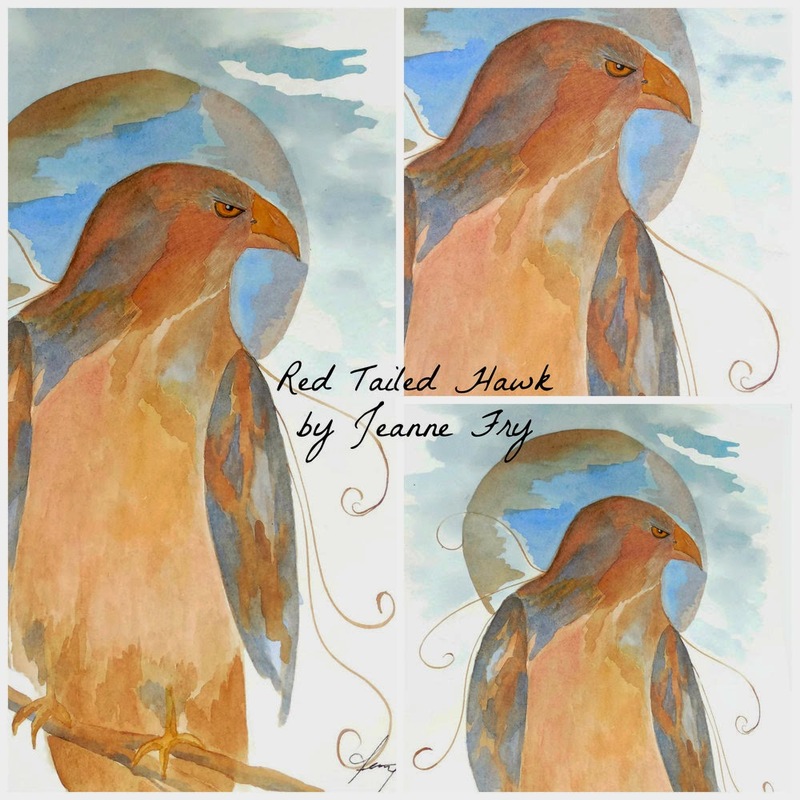 When the Red Tailed has shown up as a totem for you he is forever connected, for he usually appears when you are making strides in your life toward living your true Soul Purpose. As we strive to live the life were meant to live there are times when we feel that we have reached a plateau...not necessarily "stuck", but may have the feeling as if we are just "dog paddling". Frustration can set in as we can sense when the next level is right at our fingertips, yet can seem unattainable. When that frustration is left unchecked, our visionary perceptions become dull. 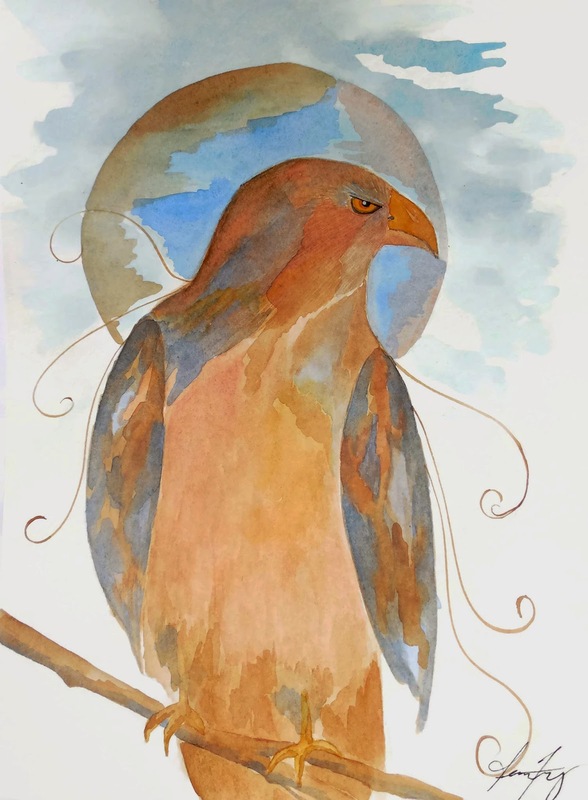 This is the time to reconnect with the Red Tailed, for he can help us remember that balance between reaching for the lofty heights and remaining strong and grounded. He can help us recognize when others around us may not have our higher good in mind, thwarting our efforts. He reminds us to draw our boundaries and protect our sacred self. He knows that stepping to the side for a moment, protected in our sacredness, allows us to access the situation more fully and find creative ways to move forward. It is that moment of remembering who we are and what we are seeking. He can guide is in utilizing our power, reminding is of the strength we carry, and to use our power with care. As I get ready to move from the Winter's quiet time into the the New Beginnings of Spring, I am grateful for the reminder from the Red Tailed - reminding myself of who I am and where I am going. And for the knowing that I am Divinely Protected and Loved. 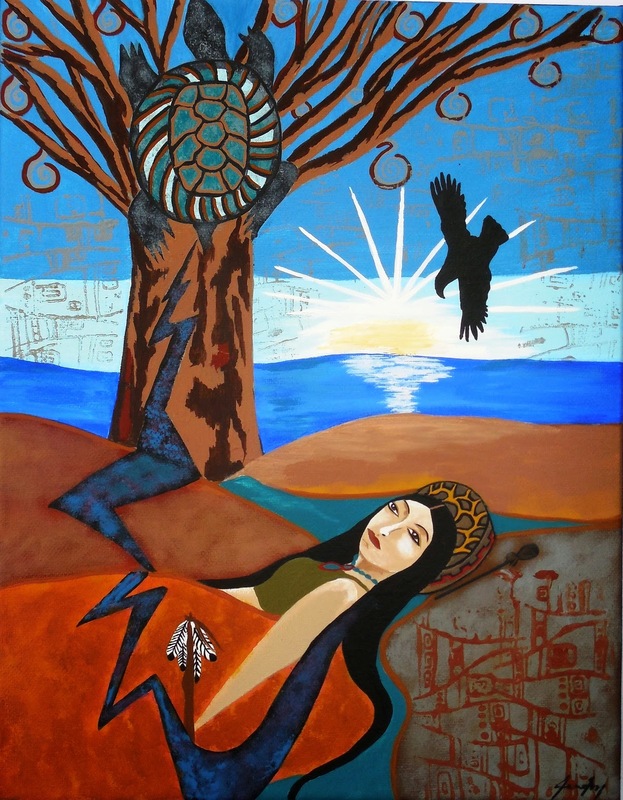 Being fully connected with something bigger than yourself....when every moment of your being breathes in sacredness, effortlessly....when one is committed to living consciously....These are the feelings that I wanted to portray in my newest painting, "Sunrise on Sacred Lands". 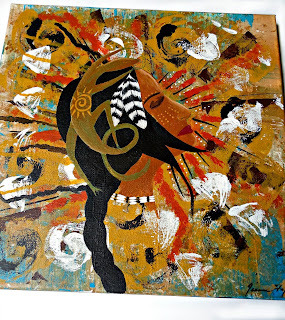 As an original piece of Visionary Folk Art, it speaks of the spiritual soul on their journey. 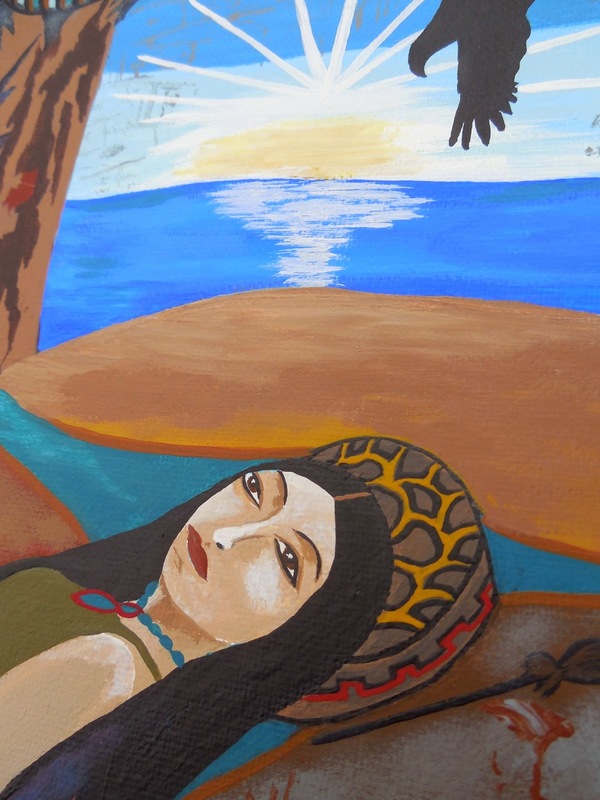 The native woman's connection with Mother Earth is shown by her waking from her sleep, lying nestled in the rolling hills as if they were warm woolen blankets. Her frame drum is her pillow, referencing her connection with the heartbeat of life and ability to stay in the present moment. She is encompassed within the lightning bolt path (energy) that leads her to the Tree of Life and seasons of her spirit. 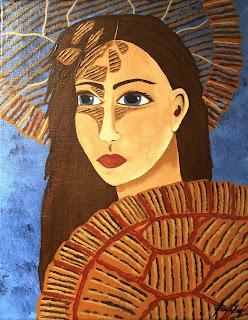 The Turtle Totem (symbolic of Motherhood) is shown climbing the tree, watching over Earth's children. The majestic Eagle can be seen flying over the water and through the glow of the sunrise. Its importance here, for Creation and the evolution of the Soul. Faint tribal designs, like etchings, can be seen blended into the background, it subtlety like the wisdom we carry...engrained in our blueprint from our ancestors. And lastly, the prayer feathers standing in the soil next to the woman...for her morning prayers and gratefulness. As she wakes she is aware of All this, soaking in every detail and thankful for her part in it. 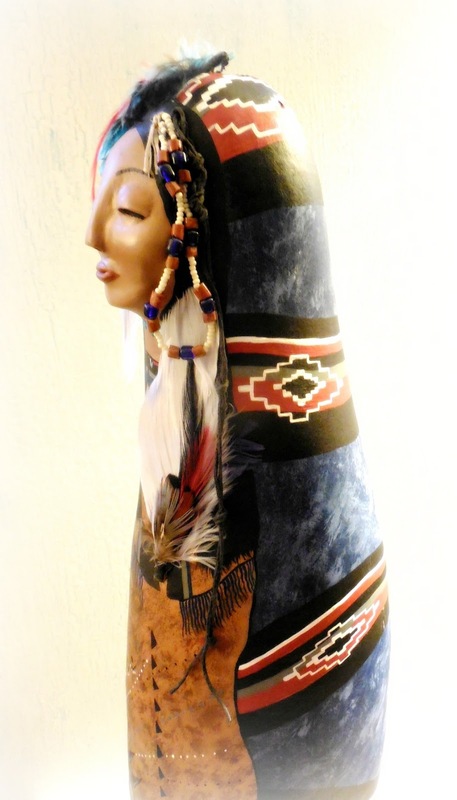 Our newest Painted Gourd Ceremony Rattle is titled "Sacred Mountains". It is an honoring of the life force of the mountains. Its symbolism represents the ability of being Grounded and Balanced on an earthly level, while at the same time the mountains allow one to be closer to the Sun, the Moon, the Heavens, and Spirit. This blend of being more fully connected with the Earth and the Sky, (Self and Spirit), fosters our intuitive senses and heightens a trust in our "knowing". Our balanced self becomes a better listener, to our own inner guide and of our guardians. The gourd rattle was painted to reflect the mountains, the layers of Earth graduating from the deeper browns until they meet a terracotta. The tip of the gourd brings in a teal blue, symbolic for the Sky. A beautiful Pink Agate is attached at the tip of the gourd rattle, symbolic for strengthening intuition and compassionate relationships with Self and Others. Fear seems to continue to be commanding life as we know it, and affecting so many tender spirits. After a while it changes who you are, how you think and make decisions, and how you relate to others. There are so many violent and bullying acts, oppression, and intolerance, and Fear always seems to be involved. It's a tough world out there, but it is also a very beautiful one. Sometimes we have to remind ourselves to break it down to ....taking One Day at a Time. Those days of struggle are what inspired my newest gourd art creations, "Sweet Dreams". I wanted to create a reminder, a new focus, a little piece of mind....an artwork that would remind you at the end of the day that everything is going to be okay. That you are loved. That you are cared for. And that tomorrow is a New Day. She bids "Sweet Dreams", bringing wishes of a healing respite while you sleep and building your strength for the new day. If there are any pieces of our artwork that you fall in love with and aren't available anymore, you can message us to see about future availability. Hello and welcome to our blog ! This is where we take the opportunity to connect with you, share the inspirations behind our artwork, their symbolism, new pieces, and explore new ways for our creative expression. Along the sidebars you can find links to connect with us in our other little homes on the web. 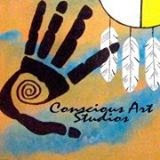 Visit Conscious Art Studios's profile on Pinterest.